The European Union’s Election Observation Mission (EOM) has recommended the Maldives take steps to clarify jurisdictional overlaps and to ensure the transparency of campaign finance. “Our recommendations are focused on improving the environment for the next elections here in the Maldives,” said Chief Observer Edward Kukan. “They are potential solutions, cornerstones for debate,” he added. Presenting the final report of the mission conducted during the Majlis elections in march, the observers also advised further efforts to reduce vote buying and to guarantee secrecy of the vote. As well as highlighting Supreme Court “interference” in the electoral process, the EU mission suggested that the dismissal of senior elections commissioners less than two weeks prior to polling violated both the constitution and the Elections Commission Act. “Legislation should clearly define the division of the competencies of the courts, the Election Commission, the police and the Anti-Corruption Commission during the electoral process,” read the report. The EOM also noted the lack of clarity surrounding the legal validity of the 16-point guidelines introduced by the Supreme Court during last year’s presidential elections. The mission – which also conducted media monitoring – called for an amendment to Article 27 of the constitution, which relates to freedom of expression that is not deemed contrary to the tenets of Islam. The report recommended changing the article to bring it into alignment with the Maldives commitments under the International Covenant on Civil and Political Rights (ICCPR). Additional recommendations made by the group included greater efforts to promote the participation of women, whom the report described as being “acutely under-represented in public life”. The decrease in the percentage of female MPs elected in March was viewed in the report of growing conservatism and de facto discrimination across society. Following suggestions of local civil society that the fairness of the poll had been threatened by ‘money politics’, today’s report called for the overhaul of campaign finance rules. Regulations regarding “third party spending and in-kind” contributions” ought to be implemented, said the mission, while there should be an effort to minimise the use of state resources and a moratorium on candidates’ opening public works during campaigning. Mission members noted that road construction projects were inaugurated in Addu atoll in the presence of President Abdulla Yameen and Progressive Party of Maldives candidates – a task normally reserved for the city council. Observers noted receiving reports of widespread vote-buying, threats, and bribery – these included the distribution of TVs and washing machines, scholarships, loans, and medical treatments. It was also noted that the deadline for the declaration of campaign spending by candidates currently comes 14 days after period for legally challenging results expires. Further recommendations made today included measures to protect the secrecy of small numbers of voters casting their ballots outside of their constituency. The report argued that people should be allowed to register as voters in the constituencies in which they permanently reside in order to be effectively represented by their MP. Currently, Maldivian citizens are permanently registered on the island on which they were born. With regards to the media environment, the mission suggested a merger between the Media Council and the Broadcasting Commission in order to provide a “clear delineation of responsibilities” for oversight during future elections. The EU’s mission involved 30 observers from 16 EU member states, observing the entire electoral process including the legal framework, campaigning, media conduct, voting, ballot counting, and the general electoral environment. The week began with 302 candidates and 189,000 voters taking part in the Maldives’ second multiparty Majlis elections. After polling proceeded without notable incident, preliminary results quickly showed that the governing Progressive Coalition had secured a clear victory – later confirmed as a 53 seat majority in the 85 seat legislature. President Abdulla Yameen – whose Progressive Party of Maldives (PPM) took 33 seats – interpreted the result as a ‘yes’ to peace and stability and a chance to pick up where his half-brother Maumoon Abdul Gayoom’s ‘golden 30 years’ had left off. Meanwhile, Foreign Minister Dunya Maumoon – daughter of former President Gayoom – saw the result as a rejection of “foreign interference” and a show of support for her father and uncle’s leadership. Coalition ally the Maldives Development Alliance noted that the result – in which it took five seats – as a sign of public confidence in the relatively young party. Despite being upbeat about his party’s 15-seat haul, Jumhooree Party leader Gasim Ibrahim accused his coalition allies of fielding independent candidates in violation of pre-election agreements. While Yameen acknowledged that vote splitting may have detracted from the size of the coalition win, the immediate effects appeared to have benefited his party, with two of the five successful ‘independent’ candidates switching to the PPM before the official results had been announced. A further source of discord within the coalition loomed large after Gasim threw his hat into the ring for the Majlis speaker’s position this week. Though Gasim told local media he had the coalition’s full backing, the PPM subsequently announced its intention to field its own candidate. The impact of the defeat on the Maldivian Democratic Party (MDP) – who won just 26 of the 85 seats for which it fielded candidates – looks likely to be a period of restructuring, with former President Mohamed Nasheed calling for new leaders to step forward. All observers of the elections – partisans and neutrals alike – expressed concern at the ‘money politics’ involved, with both the MDP and Adhaalath parties blaming such practices for their own poor performances. Despite the foreign minister’s prior comments, both the EU and the Commonwealth observer missions focused on the negative impact the Supreme Court’s dismissal of Elections Commissioners had upon the electoral environment. Amendments to the Decentralisation Act, which would resurrect previous previously thwarted plans for streamlined local governance, were this week introduced on behalf of the government. The resuscitation of the Nasheed administration’s attempts to transform the country’s energy sector also continued with the outlining of the Accelerating Sustainable Private Investments in Renewable Energy (ASPIRE) programme. The government’s transformation of the island of Meedhoo appeared not have gone to plan, however, after a recently initiated reclamation project was halted due to its potential environmental and health impacts. The Immigration Department revealed the success of a recent repatriation programme for illegal migrant workers, while employees on the Vilu Reef resort were also given their marching orders after having taken part in strikes. In the courts, the decision to uphold a prior ruling saw the return of a five-month-old child to it’s German mother, while the Criminal Court heard the final disturbing details in the 2010 murder of Mariyam Sheereen. The Tiny Hearts of Maldives NGO this week held their annual camp in Malé’s IGMH, providing expert care for children with congenital heart defects. Meanwhile, in Addu, investigations have begun in the events that led to a death during childbirth at Hithadhoo Regional Hospital. Jumhooree Party (JP) leader Gasim Ibrahim has stated that, while he is satisfied with the results of the parliamentary elections, independent candidates affiliated with the governing Progressive Coalition cost the group seats. Speaking at a press conference held on Sunday (March 23) at the party’s campaign headquarters, Gasim revealed that out of the 28 constituencies in which the JP had contested, leading figures of the ruling Progressive Party of Maldives (PPM) had independently contested in eight. He stated that the provisional results being announced by various media outlets displayed the losses that this decision has caused the coalition due to vote-splitting between the coalition aligned candidates which led the opposition Maldivian Democratic Party (MDP) to win those seats. Gasim admitted, however, that members of the JP had also contested in three constituencies in which the PPM was allocated, thereby causing the same loss. He added that, although both parties had previously announced that they will penalise members who contested independently, neither has taken any such action as yet. 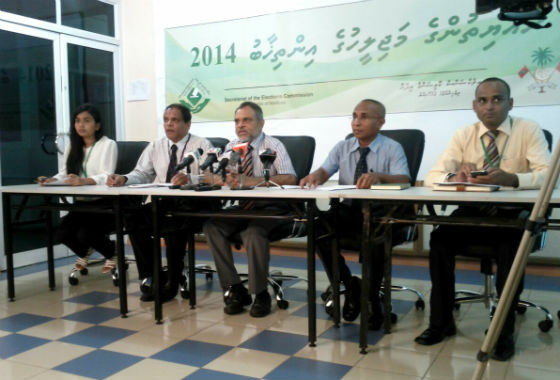 “We saw PPM challenge slots that the coalition had granted to us. And then right after that, Adhaalath Party – who used to work very closely with us – also went out and contested. They said that they will contest in the 28 constituencies that were given to us,” Gasim stated. The JP leader went on to express hope that the independent candidates who have gotten elected to the parliament would work together with the coalition, stating that they are people “who have had ties with the JP and PPM from before their decision to contest”. He added that with this alliance he is confident that the government coalition will get a three quarter majority in parliament. He further said that the results of the parliamentary elections are “proof of the public’s acceptance of the current administration”, and of the rising sense of awareness among the public. “We must make good use of the opportunity before us. If we try to abuse it, then whether we be government or someone else, no good will come of it,” he continued, stating that upon receiving majority in parliament, the focus should be on serving the citizens. Gasim further stated that he is “not too keen” on acquiring the position of parliament speaker in the newly elected 18th Parliament. “I will know for sure only when the time comes. I am not keen on it. I have been given that opportunity even previously,” Gasim stated on the matter. At the press conference, Gasim levied heavy criticism against the religious conservative Adhaalath Party which had backed the JP in the early rounds of the 2013 presidential election. The Adhaalath Party (AP) contested in 13 constituencies in the parliamentary elections, but managed to win only one seat. Gasim stated that if the AP had accepted the four slots that the JP had offered them and run from within the coalition, they would have had a better chance at winning seats. “It would have been better for the Adhaalath Party if they had accepted the four seats we offered them. But then, it’s only when a person dies that the living realise his true value. Some people are only able to appreciate how kind their parents were only after they pass away,” Gasim said. He added that the decision of the AP’s leadership had caused them “irreparable damage” in this election. I found his words very unpleasant, it is not the kind of words that a person who maintains such Islamic principles would utter,” Gasim said. “I responded immediately to his words. I said ‘so this is what it all comes down to. Now we are getting to see the truth. Out of impatience, you are struggling to come out of the womb in whichever way possible’,” he stated. While the Elections Commission’s official provisional results are pending, local media reports that the JP has won 16 seats and the AP has won one seat out of the total of 85 seats in the 18th parliament. Foreign Minister Dunya Maumoon has described the Progressive Coalition’s victory in the Majlis elections as vote of confidence in President Abdulla Yameen as well as a signal to foreign powers to stay out of the country’s affairs. “Maldivians have said yes to President Yameen’s strong leadership,” said Dunya. She also interpreted the coalition victory as a sign of voters’ faith in the leadership of her father, former President and Progressive Party of Maldives (PPM) leader Maumoon Abdul Gayoom – President Yameen’s half-brother. Fellow cabinet member, Tourism Minsiter Ahmed Adeeb, reiterated Dunya’s comments during a press conference held today, adding that opposition MPs would now be unable to further “obstruct” the government’s efforts. “This shows that the ideology of President Maumoon Abdul Gayoom and the policies of President Abdulla Yameen has the full support of the people as well as the extent of support for [Progressive Coalition partners] Honourable Gasim Ibrahim and Honourable Ahmed Siyam Mohamed,” said Adeeb. Dunya’s press statement came as the results of the elections to the 18th People’s Majlis are being finalised. Preliminary reports suggest a clear victory for the PPM and its allies – the Elections Commission is expected to announce the preliminary results in the coming hours. “I wish to congratulate the people of Maldives for their belief in the value of democracy. The world should not underestimate the perseverance of Maldivians. I also wish to congratulate the Elections Commission for holding the elections in an efficient, free, fair, and transparent manner,” she stated. Dunya served as the State Minister for Foreign Affairs under former President Dr Mohamed Waheed Hassan, and was a key figure in defending the legitimacy of Dr Waheed’s cabinet in the international community following former President Nasheed’s allegations of coup d’état following his February 2012 exit from power. “The Elections also shows that Maldivians have said a resounding ‘NO’ to the efforts of some to invite foreign interference in domestic politics through a number of statements issued telling Maldivians how to organise our own affairs”. “I wish to congratulate the people of Maldives for their belief in the value of democracy. The world should not underestimate the perseverance of Maldivians. I also wish to congratulate the Elections Commission for holding the elections in an efficient, free, fair, and transparent manner”. The foreign minister’s praise of the Maldivian people – whom she stated have shown “tremendous determination” to resist attempts to cause “internal disharmony by inviting international pressure” – echoed statements issued earlier this month. On March 3 – after the European Union and civil society groups had voiced concern over the actions of the Supreme Court – Dunya requested that international communities refrain from comment which “undermine” the Maldivian judicial system. International concern at that time had come in response to court’s pursuit of contempt of court charges against the Elections Commission (EC) over comments made in a privileged parliamentary committee regarding the annulment of last year’s presidential election first round. The Supreme Court accused the EC of contempt, claiming it had criticised the verdict which had annulled the first round of presidential elections held in September 2013, as well as disobeying a Supreme Court order by dissolving eight political parties last month. The Supreme Court subsequently dismissed the senior members of the Elections Commission just weeks before the parliamentary elections – a decision roundly condemned by the international community. “We request our international partners to support us. We request you to contribute constructively in overcoming our challenges. We urge you not to undermine our judicial system,” said Dunya during the 25th session of the UN Human Rights Council. “We call on all to respect our institutions, young though they may be. And we urge you to base your partnership with us on dialogue and cooperation, not on judgment and retribution,” she added. Jumhooree Party (JP) Youth Wing President Moosa Anwar has filed a case at the Supreme Court seeking a court order to delay Saturday’s scheduled Majlis elections. “It is a case saying that the Elections Commission must consist of at least five members including the president of the Elections Commission,” Anwar told Minivan News. The Elections Commission (EC) currently consists of three members – the mandatory quorum needed for the group to hold meetings and pass decisions – following the Supreme Court’s dismissal of EC President Fuwad Thowfeek and Vice President Mohamed Fayaz on charges of contempt of court and disobeying the court’s orders. In the days following the court’s ruling, the Majlis approved Ismail Habeeb as the commission’s third member – joining existing commissioners Ali Mohamed Manik and Mohamed Farooq. Anwar’s case also concerns the Majlis’ rejection of the Supreme Court’s ruling. A letter sent to senior government figures following the dismissals argued that the EC leadership was removed in contravention of the constitutional procedures governing their appointment and dismissal. The letter was signed by both the Speaker of the Majlis Ahmed Shahid and Deputy Speaker Ahmed Nazim – MP’s with the Maldivian Democratic Party (MDP) and the Progressive Party of Maldives (PPM). “I have also requested the Supreme Court to disqualify their parliament membership and also their candidacy for this election,” said Anwar. The case was file with the court at 1:30pm today, explained the JP member, although he had yet to receive confirmation that the court had accepted the case. The Supreme Court earlier this week advised the EC that polls could proceed, despite the failure to gain the signatures of all candidates. Approval of the voter registry was mandated in the Supreme Court’s 16-point guideline accompanying its annulment of last year’s presidential election first round. Anwar explained that his decision was not a party one. “None of the JP leaders have been informed. It was done on my own,” said Anwar. News of Anwar’s case comes as an audio clip of JP leader Gasim Ibrahim has emerged on social media which appears to indicate unrest within the governing coalition. In preparation for the upcoming Majlis polls, the three parties in the governing Progressive Coalition – PPM, JP, and Maldives Development Alliance – had agreed to allocate constituencies among the coalition partners, with the PPM contesting 50 seats, the JP contesting 28 seats, and the MDA contesting seven seats. In the 2:49 clip, Gasim appears to criticise President Abdulla Yameen, former President and PPM leader Maumoon Abdul Gayoom, and Home Minister Umar Naseer. The audio appears to have been recorded after the revote of the presidential election, held on November 9 in which candidate Gasim finished third. The court’s decision to annul the first round of the presidential poll came after Gasim had lodged a case alleging inconsistencies within the electoral register used on September 7. “We couldn’t support Anni [MDP’s Mohamed Nasheed] because his principles are bad. We know how things are with Yameen. They are full of brutality,” he is heard saying. As a result of the alleged mistrust among coalition leaders and their efforts to exert political influence over one another, the MDP contended that living standards have fallen and government services have deteriorated in the past four months. “MDP has always been advocating that in a presidential system the public will not benefit from a coalition government. At such a critical juncture, this [leaked] phone calls has revealed the extent to which the coalition has unraveled,” the statement read. Sittings of the first session of the People’s Majlis for 2014 will resume after the parliamentary elections scheduled for March 22, Speaker Abdulla Shahid said today. Concluding today’s sitting held to approve a nominee to the Elections Commission, Shahid said the decision was made after consulting political parties. The first session of 2014 started on March 3 with the delivery of the presidential address, after which the speaker announced that normal sittings would resume after this month’s parliamentary polls. The 17th parliament began its first session on May 28, 2009. “The EU Delegation notes with concern the current action of the Supreme Court on its own initiative to bring before it members of the Elections Commission who have expressed concern over its judgments,” read a press release from the EU delegation based in Sri Lanka. The court’s decision to bring the charges of contempt of court refer to criticism of the decision to annul last September’s presidential election first round. The EC has also been accused of disobeying a Supreme Court order by dissolving eight political parties earlier this month. September’s annulled vote had been universally praised as free and fair, while the evidence used to cancel the result has been criticised by the UN as well as EC President Fuwad Thowfeek. In addition to utilising new ‘Sumoto’ (or ‘Suo motu’) regulations that allow the apex court to initiate hearings and act as both plaintiff and judge in a trial, the Supreme Court’s contempt charges are based on privileged testimony given to the People’s Majlis by EC members. Article 90 of the constitution says no person will be subject to any inquiry, arrest, detention, or prosecution with respect to anything said in the People’s Majlis or any of its committees if such a statement is not contrary to tenet of Islam. However, claiming the establishment of justice to be a tenet of Islam, Supreme Court Judge Ahmed Abdulla Didi has said the EC’s testimony at the independent commissions oversight committee obstructed justice and could therefore be used in court. The Supreme Court has said that no party has the authority to question or criticise its decisions as per Article 145 (c) of the constitution which states that the Supreme Court shall be the final authority on the interpretation of the constitution, the law, or any other matter dealt with by a court of law. The issue of separation of powers has been a regular theme this week as politicians continued to campaign for the March 22 poll, with leaders from both the Maldivian Democratic Party (MDP) and the Progressive Party of Maldives claiming that their parties can best ensure the three branches of government are kept apart. Most recently, while campaigning in Malé for the governing coalition on Sunday (February 23), former President Dr Mohamed Waheed suggested that “we have separated the power so much that the country is suffering”. 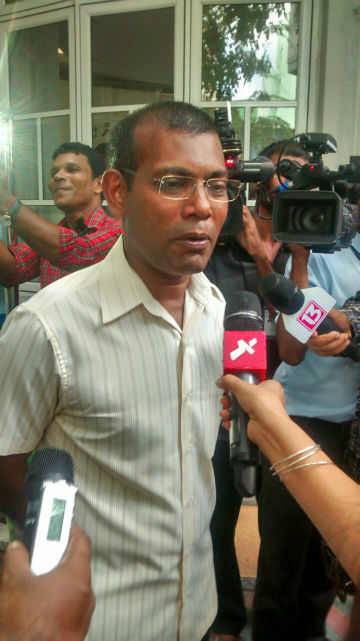 “This country can’t go forward if we separate the powers any more,” said Waeheed. Former President Mohamed Nasheed yesterday told representatives of the UN that he did not expect his MDP to take part in the elections should the EC members be arrested and replaced. The ruling Progressive Party of the Maldives (PPM) has pledged to take disciplinary action against party members who are contesting the March parliamentary election as independents. In a statement issued yesterday, the PPM said independent candidates were “illegally” using the party’s logo in their campaigns. The party has publicised a list of coalition approved candidates on the party website. Meanwhile, former President Maumoon Abdul Gayoom asked independents who are contesting Majlis elections to withdraw their names and support coalition candidates instead last night. “A PPM member or any other party member must not run against a coalition candidate. If you do so, it will be very sad for us. That is because it will divide votes of those who hold the same ideology. If votes are divided, we will lose the seat,” he said.